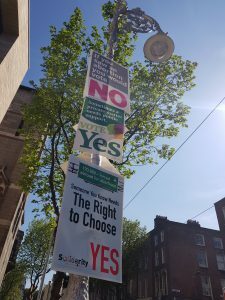 One of the most rewarding things about journalism is being there as history is made, and nowhere was that more apparent than in Dublin this weekend as the Eighth Amendment was repealed. But at the same time as it was fascinating to be there and to witness it, it is also mildly depressing to see 35 years of campaigning stuffed into the narrative grinder, and an easily-consumable but not-entirely-satisfying sausage of a story emerge out the other end. This all happened in the country I grew up in, but it’s a place I haven’t lived in for almost 20 years, and while my perspective is far from unique, it is certainly different. That’s what made it all the more surprising as we fumbled with our first drafts of history on Friday night and Saturday morning, and I found myself questioning whether or not everyone else had seen a different battle to the one I witnessed. I was amazed to see politicians who arrived late to the party get so much credit, far more than was commensurate with the effort they expended. I was amazed that, even in the aftermath, far-right Catholic fringe groups were still being asked for their opinions, despite having been resoundingly rejected by the electorate. I was amazed that the camera people and editors focussed on the celebrations and the prosecco and paper cups, and not the aching, teary, exhausted relief after a nasty, degrading battle that no-one wanted to have to fight in the first place. On polling day I started with breakfast in Marino, not far form the three Catholic schools where I received my education. On the radio, down the road from the Mount Temple school where they were formed, U2 sang, and when that song was over Sinéad O’Connor took over. Sinéad also spent part of her youth wandering these streets, up toward the middle of Griffith Avenue, and here she was singing “She Moved Through The Fair”. “It will not be long now,” she sang, and I headed out the door, looking for the best vantage point to watch our country change before our eyes. On polling day I walked the streets of my city form north to south and back again, and I spoke to literally anyone who looked like they wanted to talk to me. I stopped at Edge’s Corner in Fairview to talk to the women with the “Together For Yes” banners placards. Mothers pointed proudly to their daughters as passing cars sounded their horns. Further up on the pedestrian bridge in Fairview the No side stood, their grim placards with foetuses on them garnering little in the way of public sympathy. Struggling to read the phone screen in the bright sunshine, I translated an article from Norwegian for a woman who had been interviewed for it. She was satisfied that she had been quoted correctly. In the meantime, my phone started to light up in my pocket – my 800 words about the referendum for Sweden’s biggest newspaper had been published, and there were tweets and e–mails and the odd threat and bit of abuse to respond to. Into and around the city I went, talking, talking, talking. The No side were still confident that Ireland would come to its senses, but the arrogance and argumentativeness of the previous day on Henry Street was gone. It was more hope than expectation now. As the afternoon wore on I met Sarah-Maria Griffin, a fierce lioness with a pen like a pickaxe that chops mercilessly away at the facade of our existence through her poetry and fiction. In 2016 she raised that pickaxe of a pen high over her head and carved out the words of “We Face This Land,” a clarion call for Repeal that became a film that lit a fire. Not all of us have survived. The waves do not part. There are no miracles here. 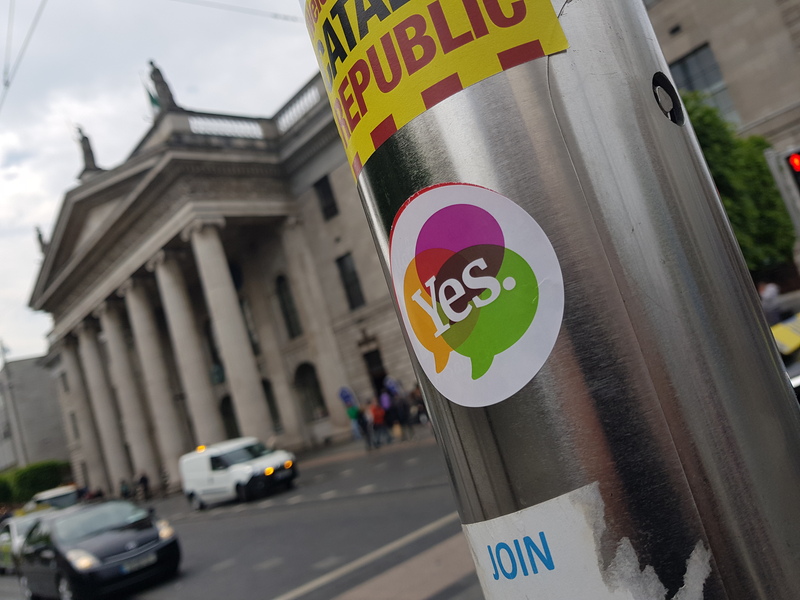 Bubbling with nervous excitement early Friday evening, she ordered a gin and told me about her writing and her life and being chased with her mother as they canvassed for the Yes side on the northside of the city. It was terrifying and uplifting at the same time, and then the lioness jumped into a taxi outside the Shelbourne Hotel and was gone, leaving a dusty cloud of powerful words behind her. By then. the throngs of canvassers on Grafton Street and O’Connell Street had thinned out, the last of the voters sent to the schools with the names like St Brigids and St Josephs and Holy Faith to cast their sometimes unholy ballots before the interminable wait for the exit polls. And then they came through, two to one, and Ireland was a changed place forever. The following morning was not an anti-climax, but the tension had been ripped out of the air before it even began. There is no exit poll with a margin of error of nigh-on 20 percent. It was like turning up to a sporting event knowing you’re the only team that can win it, except that the prize is the end of 35 years of hurt and shame and invisibilty. 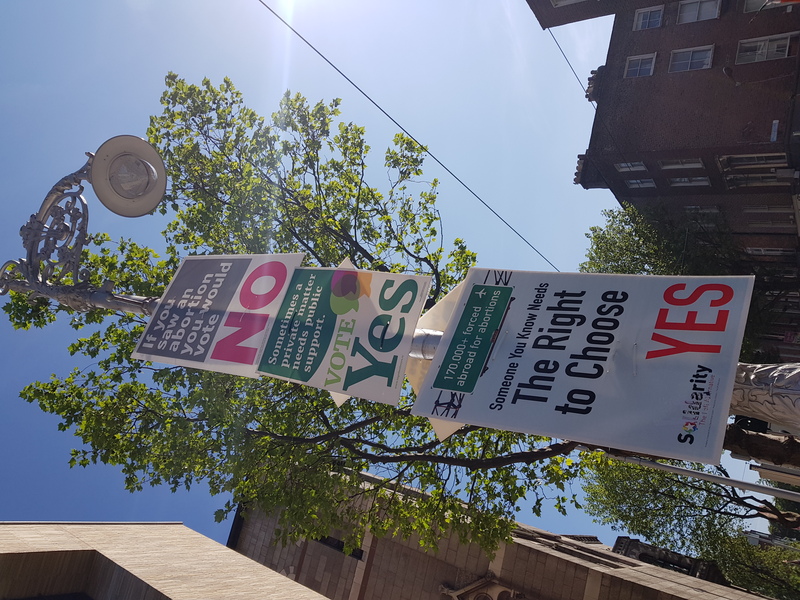 The Yes side flocked to the RDS, some joyful, some celebratory, but most just bone-crushingly exhausted and relieved that, finally, after 35 years, after the rights to information and travel, after X, after Savita, after Tuam, after symphysiotomy, after everything, this, at least, was over. Even at the RDS it was over quickly, and the women who faced this land along with Sarah-Maria streamed to Dublin Castle to stand in front of the nation as something approaching equals for the very first time. The gays were there, and the singers, and the human rights campaigners and the broadcasters and the politicians. A broadcaster, burdened by a lifetime of being in front of the camera as the debate raged but never once being allowed to have an opinion, looked relieved as they went by me in one of the narrow corridors. No more false “balance”, no more pretending that human rights are something that can or should be debated. The world’s press gathered and talked about the Catholic Church, but politely declined to listen long enough to learn how Ireland had changed and in what ways over the last 35 years. The drink and the ink began to flow and the first drafts of history were written, and while for the most part they contained similar elements, the ordinary people who were the real heroes were already slipping away. For journalists it is always easier to point to the politician with the pearly-white smile and the pithy sound-byte as the harbinger of change – they attract the cameras and the microphones and make us turn our backs on the truth. It’s like we cannot – or will not – believe that change can be brought about by ordinary people doing extraordinary things, no matter how often we see it. It’s like we need the fallacy that our leaders are somehow better than us, somehow in control to sleep safely at night, when in fact much of our insomnia and worry is their creation. It may have taken them 35 years, and in that time they were scorned and laughed at and belittled and abused, right up until Saturday morning and in some cases beyond, and yet they did it. Through the day I saw women, from teenagers who had just cast their first vote to political veterans who started out on this trail 35 years previously, gradually realising what they had done. One by one, it dawned on them the immense power that they now wield. They banded together, and over the weeks and months and years, they changed a country. They cried with relief, and some cried knowing that this is a new burden to bear – the burden of knowing what is possible, and that they cannot back away from it now. As I walked away from the courtyard in Dublin Castle I began deleting some of the interviews I had done with different men over the last four days – they were no longer relevant in this story, if they ever were. Of course, at some point we need to talk about how a tiny far-right Catholic sect is able to hijack the media every time the human rights of others are up for “debate”. We need to ask ourselves what is the purpose of the Catholic Church, if they do not have the courage to stand up and argue their case before our people, instead outsourcing it to a collection of crackpots and American evangelicals. We need to ask why our old-fashioned media are never seen on the streets, writing instead from the Dáil bar or with their feet up on their desks, rather than wearing out their shoe leather on the streets where the lives of our citizens play out. 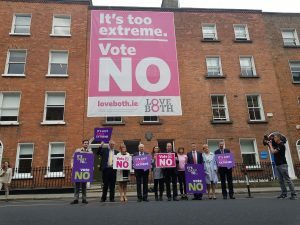 Though many in the media, especially the younger brigade and the online outlets, were outstanding, many in the older generation and the majority of the male politicians who are now anointed as saviours had little to do with the outcome of this referendum. At best, they were bystanders; at worst, active obstructors. But we know that already. We’ve heard their story time and again since the dawn of our state. We’ve watched, enthralled, as they achieved precisely nothing. But the women of Ireland repealed the Eighth Amendment. And that, now, is the only story that needs to be told. This entry was posted in Uncategorized and tagged Abortion, Eighth Amendment, feminism, Ireland on May 30, 2018 by admin.